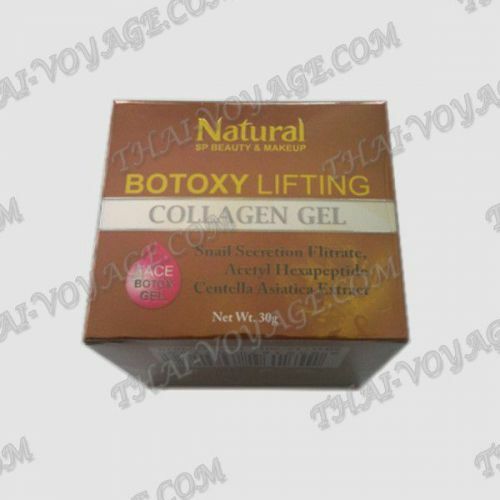 Modern lifting gel for deep skin regeneration. Created as an alternative to Botox injections, but gives a more natural result: wrinkles are reduced, but the facial expression remains free. It has excellent antioxidant properties. Anti-aging gel helps to reduce the smallest muscles and visually softens facial tension lines. It tightens and firms the skin. It increases skin elasticity and improves the tone of the epidermis, regulates the water balance of the skin cells and prevents them from drying out associated with age-related changes. Gel inhibits neuromuscular transmission without blocking it. The components of the gel, effectively moisturize, nourish the skin and help to restore the lipid barrier. As a result, wrinkles are significantly reduced, the skin is visibly smoother, gains a young, healthy and fresh look. 3. extracts of Centella Asiatic, ginseng and cucumber - a hydration, nutrition and skin tone. Application: use the gel two times a day, morning and evening for six weeks, and then move on to maintenance mode and apply the gel 1-2 times a week. Composition of the product Water; Acetyl hexapeptide-8; Glycerine; Snail-secretion filtrate; Centella asiatica extract; Methylisothiazolinone; Triethanolamine; Carbomer; Saccharide isomerate; Panax gingseng root extract; Cucumis sativus (cucumber) fruit extract.